we bring you weekly updates on everything Howard County has to offer in one place, distraction-free, cost-free, and born out of a love for the place we call home. Summer is the perfect time to explore the outdoors, and nature-lovers living in Howard County are extra lucky: the area is full of hiking trails, farms, and wildlife sanctuaries. If you’re planning a family trip venturing into the great outdoors, you may be wondering where to start. We’ve tackled this question by rounding up the best parks, farms, and nature centers in HoCo, their main attractions, and how to learn more as you plan your family’s adventure. Centennial Park has 337 acres of land surrounding a 54-acre lake, with a 2.6-mile pathway perfect for a stroll in nature. The park has nine picnic pavilions that are available for your convenience, as well as boat rentals for the lake during the summer and early fall. Many different activities are hosted at the park during the year, including outdoor concerts, 5k runs, and a variety of water-sports classes! 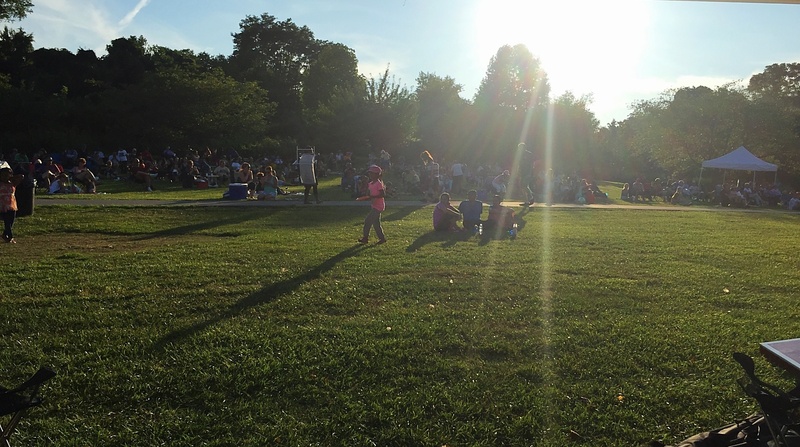 Pictured above is our view of Centennial Park from the Apex booth during Sunset Serenades, a recent concert series held there that was sponsored by Apex. Bring your family to the Howard County Conservancy to explore the 4 miles of hiking trails and go on a walking tour. You can take a peek at the butterfly garden, and start a geocache adventure on their lengthy trails. Take a peek at their maps and upcoming events to plan your perfect trip! Larriland Farm is the place to go for pick your own fresh produce. Their abundance of farmland provides lots of selection for your own picking, and they recently added more acreage for a pumpkin farm in the fall. To see what’s ripe for the picking, check their Harvest Page. The Robinson Nature Center provides a nature learning experience on 18 acres of land and approximately 1-mile hiking trails. They also have an outdoor “nature place,” which is a play area for children to explore. To learn more about what the nature center has to offer, browse their facility guide. Savage Park offers 2.8 miles of trails to explore wildlife and scenery along the Little Patuxent River. They have pavilions, a playground, and different types of sports fields on site. This park is also well-known for their great running trails and quiet surroundings. During your visit, don’t forget to stop by the Historic Savage Mill! Thanks for reading this week’s #HomeSweetHoCo! Looking for your own space in Howard County? Contact us! Haven’t been keeping up with Home Sweet HoCo? Don’t fret: check below for all previous posts!